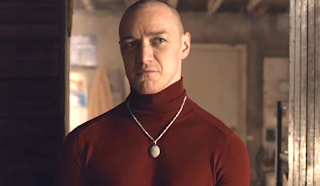 Not everything is what you think it is in “Split” a dark psychological horror thriller from Universal Pictures that will keep you on the edge of your seat. Anyone who’s anyone knows how M Night Shyamalan movies go, because there’s always a twist at the end that you never see coming. This is no different as M Night Shyamalan’s 14th film to date, with this current film he wrote, directed, produced, and as always starred in. The original choice for the leading role was going to be Joaquin Phoenix but that fell through thankfully they chose James McAvoy for the lead in this cliffhanger. James McAvoy’s (X-Men: Apocalypse, Filth) portrayal of Kevin a man with D.I.D. (dissociative identity disorder) is a compelling tour de force, playing many different characters all in one man. Along side him the stunning Anya Taylor-Joy (The Witch, Morgan) plays Casey Cook one of his captives, also in this mind bender is the great Betty Buckley (Carrie, The Happening) is no stranger to horror or Mr. Shyamalan’s movies and brings a baseline to the film as she plays Dr. Karen Fletcher, Kevin’s psychologist trying to help him. If you feel jaded by other M Night Shyamalan films get ready because you won’t be with this one, he’s back and better than ever. The twists and turns never stop even with comedic relief at times but mostly it’s just nervous laughter because you’re just that creeped out by the whole premise. With the budget only being $10 million this movie is considered low budget, but with the claustrophobic feel it wasn’t necessary to have a big budget anyway. What really sells this movie is James McAvoy performance his character screams at you through the screen with the mere twitch of his brow he switches personalities and you begin to learn who’s who. As Casey and the others fight for their lives to escape you have a morbid need to root for Kevin just to see what happens next but also pity him too. The build-up to the climax is ever marching on making you beg for more. If this is what M Night Shyamalan has in store for the future I definitely can’t wait for his next film. Overall this movie is very well made and very well executed, even with the controversy of the stigmatized depiction of people with mental health issues still this movie earns a place on the shelf of horror cult classics and definitely worth the ticket.